When it comes to eyelash serums, I'm guessing that what everybody really wants to know is if they really work and aren't just another expensive beauty myth. Hair growers are a tricky subject with mixed reviews. Do they work or don't they? Eyelash serums usually carry price tags that vary from around P1000 to upwards of P5000. When it comes to this product, you really get what you pay for. I've tried the cheaper ones and no, they don't work. What worked for me in the past is Revitalash but the transformation was very gradual. It took about 6 months before I noticed results (i.e. when I was finally able to curl my lashes effortlessly...they were so short before even professional make-up artists had a difficult time doing it for me). Still, I am very happy with my lashes and highly recommend the product. Only problem is, Revitalash is a bit pricey...costs about P6k for a regular sized mascara-like vial if I remember right. Which brings us to Rejuvalash. Rejuvalash retails for around P2k+ and promises results in 21 days. 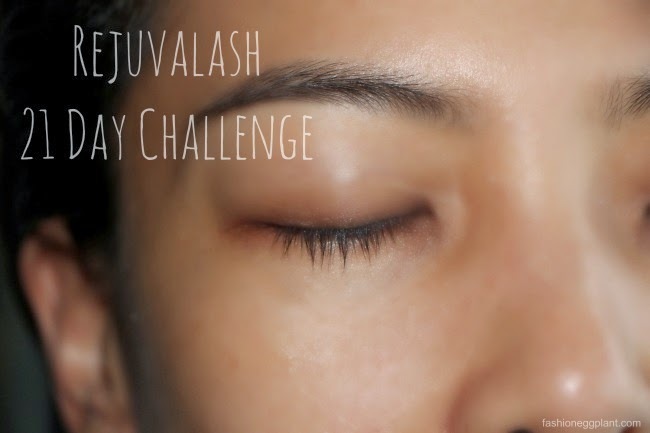 I'm not sure about 21 days...eyelashes are short to begin with and I don't really know how to accurately measure them to check for minute growth but if it manages to maintain what Revitalash has done for me then I guess I'm sold...if in the long run my lashes grown even longer than better. What I'm really after is a more affordable version of Revitalash. If Rejuvalash can do the job for half the price, why not? So let this 2nd day of January in 2014 commence the first day of my 21 day Rejuvalash challenge! Apply like liquid eyeliner at the base (where hair growth begins) of top and bottom eyelashes once a day. I usually do it before bed.